Makerspaces are about the students. You want to make sure that the procedures you create are student-focused. Meet with a group of your students and brainstorm procedures together. By giving your students voice in the process, they’re more likely to actually follow the makerspace procedures. Every makerspace is different. You can’t just copy and paste the procedures from another school’s makerspace and expect them to work perfectly for you. Find what solutions are most successful for YOUR space and YOUR students. Try to create procedures that give students as much independence as possible. If they need you to assist them all the time (i.e., unlocking technology, approving items for storage, etc) that takes away from your time working with students on projects and adds frustration. Create your procedures as early in the year as possible and enforce them right away. The longer you wait to get procedures in place, the more likely students are to create bad habits that will be difficult to break. Safety – Do students need googles, hair tied back, gloves or other items? Accessing supplies – How do students get to supplies, and what are they allowed to use? Storing supplies – Where do students put supplies when done? Sharing supplies – What happens if another student has something that someone wants to use? Damage – What happens if something breaks? Clean-up – How and when do students clean up their spaces? Project storage – Where can students store in-progress projects? Check out my post on our after-school Makers Club, where I talk about some of our procedures. 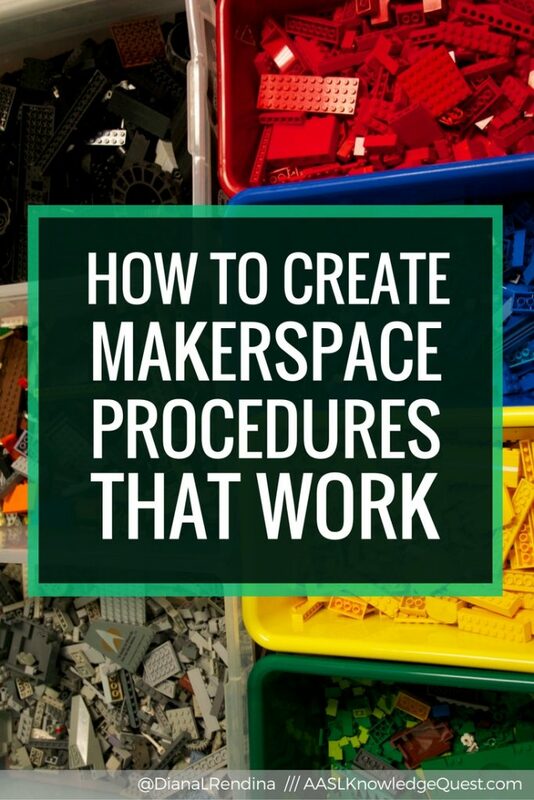 What are some of the procedures that you have in place in your makerspace? Do you have any ideas to manage student sign up during lunch periods? I don’t want Library/Makerspace it to be a punishment nor a reward and I want the system to allow all students the opportunity without a lot of fan fair. I’m looking for a sign up system that encourages a variety of students. Any ( and all) suggestions are appreciated. This is a Middle School. Do you have the students do any kid of reflection on what they have constructed? @Carolyn – I had a general lunch pass system at my previous school. Students had to fill out an application (basically saying they wouldn’t behave badly) and have their lunch period teacher sign off on it. After that, they were added to a list of students who were allowed to sign out passes from the admin during lunch. I limited it to 10-15 passes per lunch. It worked most of the time. @Sylvia – I usually have students reflect through sharing. Students might make a video talking about their project – what went wrong, what they would change etc. They might make a presentation to the group or over a video conference. I never got into written reflections and maker’s notebooks (yet) but that’s a great option too.